Local political races, as we all know, can be quite the spectator sport. There is a school board race in Rapides Parish that may have gained a few more "fans". In District C of that Central Louisiana parish, there is a candidate that recently put up a sign that has the whole community talking. By the way, Jamie Floyd is a former police juror in Rapides Parish who once put forth a controversial motion to display the Ten Commandments in the Rapides Parish Courthouse. I'm sorry if I offended anyone with this sign. I have used this line in a past Town Talk article and never once received a negative comment. I also ran it by other races before putting it out and they understood what I was saying. I do believe in creation and not evolution. That I am not sorry for. 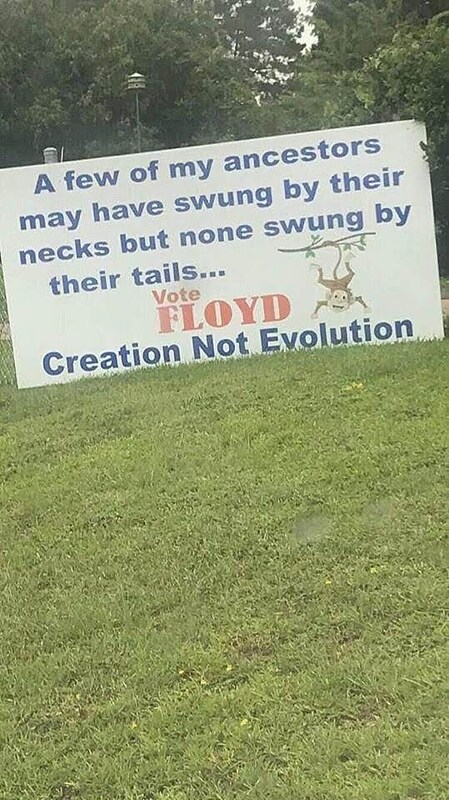 The sign has since been taken down and Floyd says he will not use it again.